This week I was lost in a surrealist discussion with an American describing me the usefulness of the war. I was not feeling well with his view on the use of violence. When he was explaining his perspective of the world, my mind slipped away due a large picture from a painter next to him. The painting was beautiful coming from some ancient age where the civilization was already violent. and suddenly I was wondering ? what's left from a old civilization ? their art or their violence ? Looking at the American talking about the usefulness of committing crime, I was sick but in my inner feeling I was pretty sure that art will take over. 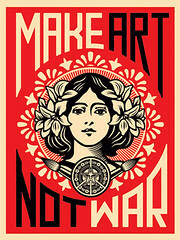 Violence is useless… The discussion came back in my mind when looking at the nice stamp "Make Art Not War" discovered on flickr. I just hope that flickr won't use violence to impose their current censorship… We really need to push forward art to avoid violence.